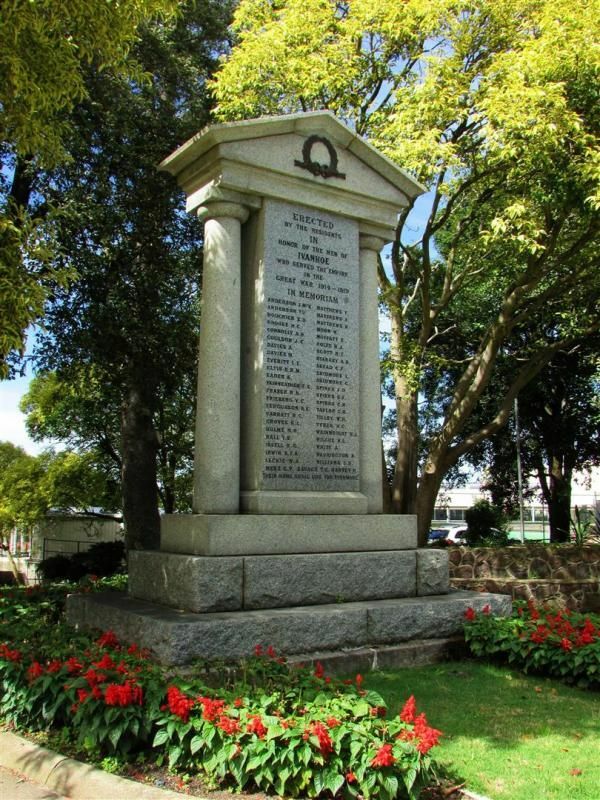 Ivanhoe War Memorial commemorates those who served in World War One. In 1995, on the 50th Anniversary of the end of the Second World War, a low pebble wall was erected around the monument. The wall features plaques dedicated to the fallen of the Second World War and those who served Australia in Korea, Malaya, Borneo and Vietnam. This is listed as a separate entry. Over 2000 people assembled at the council reserve, near the junction of Heidelberg and Studloy roads, on Sunday afternoon to witness the unveiling of the lvanhoe soldiers' memorial. Cr. F. S. Bryant, chairman of the committee, said that out of 180 lvanhoe men who enlisted 40 made the supreme sacrifice. There were 800 enlistments in the shire, which was a record in any municipality in proportion to populalation. Brigadier-General J. K. Forsyth, who performed the unveiling ceremony, said that those who went to the war had visions of fighting for righteousness throughout the world; they believed that sectarianism and all impurities in political, commercial and domestic lives might be banished. If we were to complete their work we must adhere to those splendid impulses which came to be men who went to thee war. The memorial, which is of granite, cost over £600. On the side facing the street are the names of the fallen soldiers, and on the back are the names of those who enlisted. Rev. S. Buckley said the prayers, and Mr. Ponsford sounded the Last Post. The Strollers sang Thy Long Day Closes, and hymns were sung by the crowd. Age (Melbourne), 16 May 1922. "Their Name Shall Live For Evermore"